Following the ARAC provincial training sessions; this awareness raising training session on Afghanistan constitution has been conducted with the financial support of Afghanistan Open society organization, for the professional officials of Afghanistan independent human rights commissions, department of women affairs, department of Haj and Islamic affairs, department of provincial councils, department of education, and civil society’s activists of Kunduz, Takhar, Badakhshan and Baghlan from 25-26 December 2018 in Kunduz city. In this program, beside the important subjects of ARAC’s manual on Afghanistan Constitution prepared by Hamida Barmaki Organization for the Rule Of Law and Open Society Afghanistan, the participants discussed and shared their knowledge in group works and open discussions on defination, specification, principle, importance and rule of law in a democratic society, Afghanistan experience of 1382-1301 constitution, principles of constitution, political system in the constitution, government and nation, human rights, and democracy. In the second part of the program, the students of law and political science and social science faculties of Kunduz and Salaam private university participated in the dialogue of the constitution from 23-24 December, 2018. 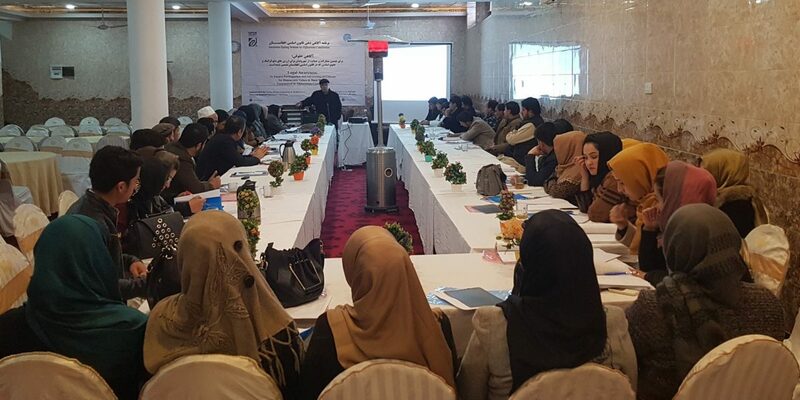 The participants were also requested to participate in the essay writing competition which will be organized by HBORL and Afghanistan Open society organization.